I'm naked. Well, except for my bright yellow SpongeBob SquarePants briefs. Standing in front of a giant -150°C soda can that is about to open up and swallow me is pretty intimidating. I'll either turn into a human Slurpee or, if all goes well, swap my tired aching legs for a fresh pair to use on Stage 3 of the Haute Route Ventoux, a time trial to the summit. Philippe Cros, aka Mr. Freeze, runs the Tag Heuer Mobile Cryotherapy Experience and hands me socks, Crocs and gloves. "Put these on, protects from frostbite. Don't touch anything". "Anything else need protection from frostbite or...uhh...shrinkage?" my wife asks. "No. Just stand still. Don't touch anything". Now anxious, I step up into the giant soda can. The doors close as my head sticks out. My fate is sealed. Well, since ancient times ice has been used as an anti-inflammatory drug. When we were kids and bumped our noggin Mom handed us a bunch of ice cubes packed in a towel to apply to reduce the swelling and pain. If Mom wasn't too mad we got a popsicle, otherwise just a stern lecture about not ever doing whatever caused the bump in the first place. Most kids obeyed, except me, I turned into a cyclist. Everyone knows cyclists aren't smart enough to stop beating up our bodies. 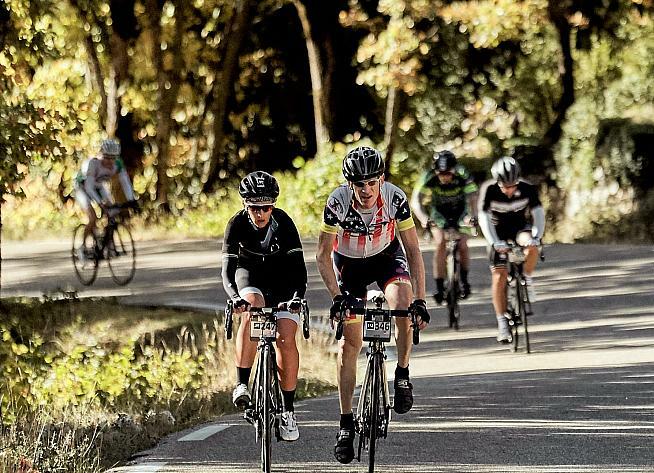 We like to abuse them, again, and again, especially at Haute Route events. So, the Haute Route folks offer cryotherapy to help riders not only ride like a Pro, but also recover like one. 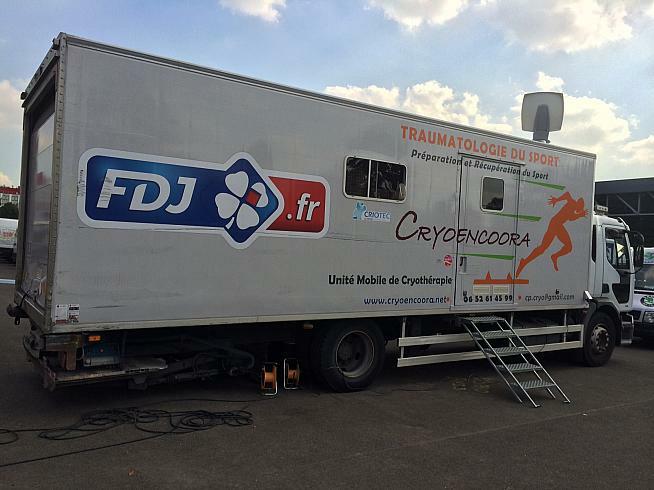 Eric Bouvat, head doctor at Pro Tour team AG2R LA MONDIALE writes: "In a stage race, the body is put under great strain. The cold helps to stop the inflammation mechanisms of the muscles that results from the extreme effort that each rider has to exert over the course of an aggressive race day. After several hours of effort, the muscles are damaged and this leads to inflammation. This inflammation can be mitigated with the use of the ice baths". 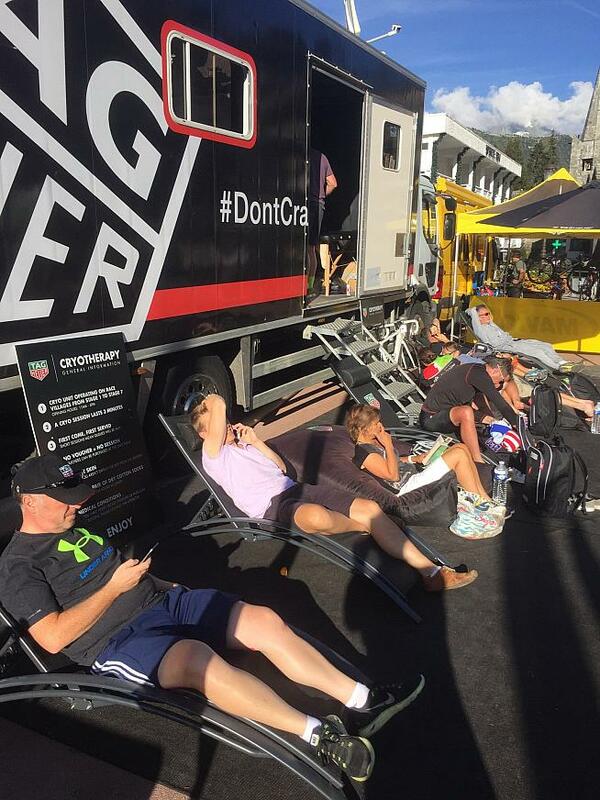 Located in the race village, Tag Heuer Mobile Cryotherapy is basically a high-tech easy-to-use ice bath on wheels. The rider standing upright, is exposed for three minutes from shoulder to toe at temperatures around -150°C/-238°F. During the session, everything above the shoulders remains out in the open. The temperature in the chamber comes from liquid nitrogen changing into its gaseous state, producing a cold similar to dry ice. The cold alleviates pain and helps reduce inflamed muscles and tendons after exercise - much better than Mom's ice pack. Pro athletes throughout the world use cryotherapy including Pro Tour teams AG2R & FDJ, NFL Super Bowl Champion Denver Broncos, NBA's Kobe Bryant, legendary distance runner Mo Farah and the fastest man on the planet - Usain Bolt. So, that's why I'm doing this. As the cryotherapy chamber fills with dry cold air I feel frosty for the first minute. During the second I rapidly open and close my hands which are frigid. By the third minute I'm freezing, but it doesn't hurt. Then it's over. The chamber opens up and I step out into a vapor cloud flowing onto the floor. That wasn't too bad. Actually, the hardest part was enduring the embarrassment of other riders seeing my SpongeBob SquarePants briefs. Afterwards I feel pretty good, but the real test is the next day's time trial up Ventoux with 125 miles and +17,000ft already in my legs from the first two stages. Warming up in the morning my legs feel stiff, not quite what I expect. I start the time trial strong though, riding at my power threshold limit of 4.0w/kg. Surprisingly, my power does not drop or taper off as I race nine miles and 3,600ft up the mountain in one hour. In fact, it stays amazingly consistent with seemingly no effect from accumulated fatigue. It's like having fresh legs. Riding at 100% of my threshold power for one hour after two tough days is a big accomplishment, especially for an old guy. 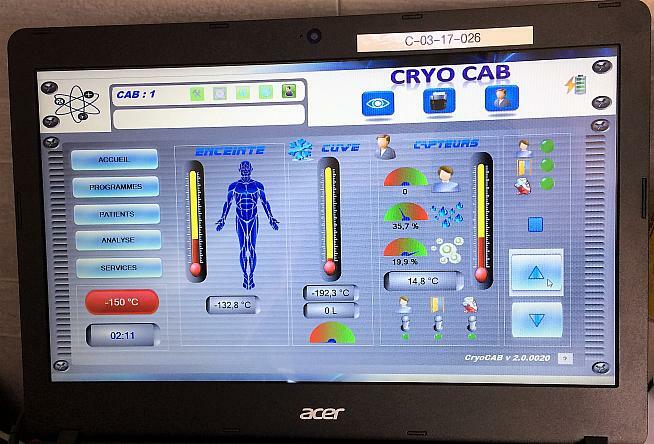 Even with only this one experience of cryotherapy I absolutely give it a cool two thumbs up. 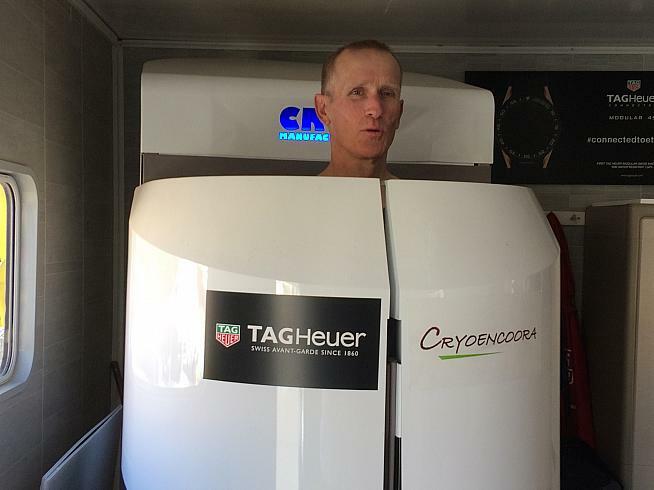 Tag Heuer Mobile Cryotherapy has only been available at European events so far, but hopefully it comes to North America events in 2018 as part of the Haute Route Pro-like experience. I'd definitely chill out again.